This project will act as a catalyst, creating 15,000 new jobs and delivering a £1bn boost to the local economy. New community facilities will be developed at Goodison Park and the Club – through Everton in the Community – will retain an active role in the area, working with local people and businesses to continue to improve Liverpool 4. The development at Bramley-Moore Dock will speed up the wider regeneration of the Liverpool Waters Economic Development Zone and help others bring forward plans for projects such as the Ten Streets. New communities will emerge alongside existing ones and Everton – one of the city’s oldest cultural institutions – will forge new relationships from a new, world-class home. A new iconic building will be created for the city, promoting Liverpool on the international stage – with an estimated audience of 1billion people watching Premier League football across the globe every week. These developments will benefit the whole of the city. 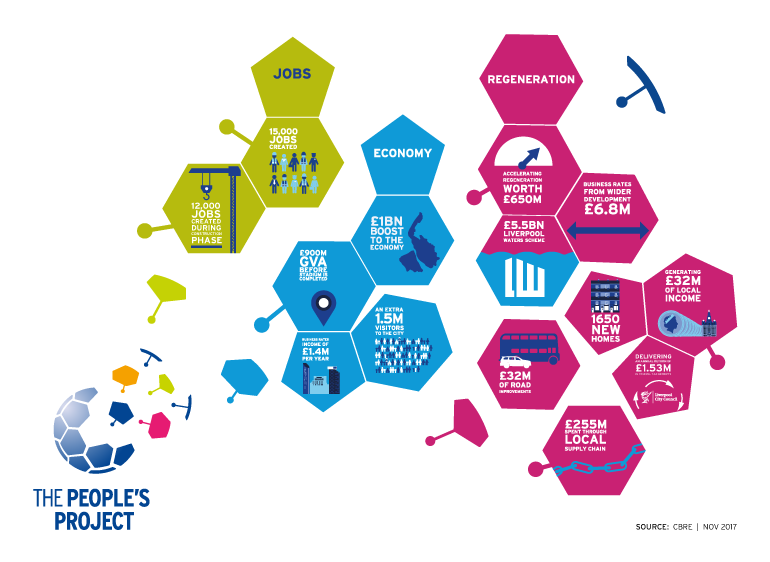 The proposals for The People’s Project will deliver a transformational change to the two locations and also to the city as a whole. The positive benefits of the proposals will reverberate far beyond the site boundaries and have a galvanising effect on the broader regeneration of the Liverpool City Region. At Goodison Park, a community-led redevelopment will take place which will respond directly to the needs and wishes of local residents and businesses. According to an Economic Impact Report conducted by economists at CBRE, the redevelopment of Bramley-Moore Dock alone will provide a £1billion boost to the regional economy and will deliver £255million in new wage income direct employment during the construction phase alone. This is a major investment which will have an overwhelmingly positive effect on the city's economy. From hotels to retail and from restaurants to taxi drivers, many stand to gain. The developments at Bramley-Moore Dock and Goodison Park will positively impact many people in the city and the wider region. 15,000 jobs will be created across both sites with a focus on local recruitment. Once complete, the stadium will attract more than 1.5million extra visitors to the city. It will also provide an additional £94million gross value added (GVA) to the local economy through retail, tourism and hotel occupancy. Operating throughout the year, the stadium could host a variety of non-football events which can offer even further benefits to the city. The stadium development will act as a catalyst at the northern end of Liverpool Waters. The development will accelerate the delivery of five new neighbourhoods along the river. This will include 1,650 people living in new homes along with hotels, leisure facilities and commercial floor space. The stadium would be a very welcome impetus to the local economy and I look forward to it moving forward. We know that a world-class stadium, on the banks of the River Mersey, will act as a trigger for even more investment and jobs which will be of huge benefit to the whole Liverpool City Region. The economic contribution to the city of Liverpool, the catalytic effect it will have on surrounding neighbourhoods, and the facilitation of the equally important Goodison legacy project make this a 'game-changer' for the city. For us at Liverpool Football Club...it would be absolutely wonderful, not just for the club but for the city if the Bramley-Moore Dock area was regenerated. A rising tide lifts all ships. A new Everton stadium at Bramley-Moore Dock would be a huge catalyst for change. The opportunity to have a development delivering a further £1bn – as well as up to 15,000 jobs – makes this a 'game-changer' not just for the Club but the city. The transformation to the city will be on a remarkable scale – and that transformation will be beamed across the globe every time we play a home game. There will be no better backdrop to a stadium in the country. Liverpool has been building up to move to an equal footing with Manchester in recent years and the waterfront development is the missing piece of the puzzle. It’s a catalytic development for Liverpool.